We come across a lot of older weaker ceilings or ceilings with smaller joists than normal. 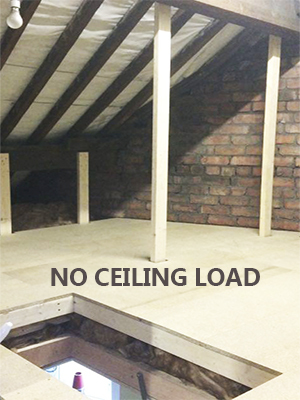 We advise not to just board direct to the joists or batten and board directly to the joists because the ceiling joists are too weak to allow the additional boarding & storage weight (load). Mainly older terraced and detached houses pre WW2 and after WW2 when we started building again we had a short supply of materials so houses were built to a very minimal specification. Although your ceiling joists are adequate (in most cases) to support your ceiling only, they were never designed to take any extra weight on them, so they must be strengthened or built above correctly to allow boarding, storage items and you to walk about safely and by adding more support this will prevent major expensive repairs in the future. You'd be surprised how much stuff we put in our lofts over the years and it accumulates to the point where you are over loading the ceiling. Time to get a proper storage supporting floor installed before you damage the ceilings for good. Cheap loft boarding versions are dangerous! Insufficient strengthening or supporting of a storage floor will cause problems with weaker ceilings and unfortunately a lot of "loft companies" out there are not aware of how to create strong safe storage sub-frames (storage platforms) in a loft. 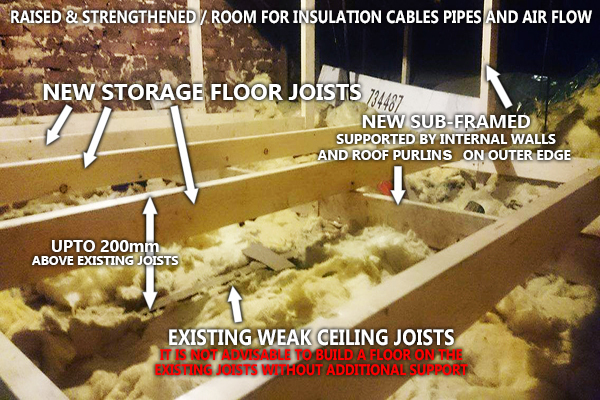 Installing directly on to the ceiling or on some 3x2 battens will only increase the load directly on the existing ceiling joists and will not strengthen it, contrary to the opinion of some companies who do not have the correct building knowledge suggesting it will strengthen the ceiling. This is incorrect information. Think about it! Add some timber battens, boards, add your storage items, you and someone else and without the correct extra support your ceiling could essentially be very dangerously overloaded. Is it really worth the risk of going for a cheap alternative which will only overload your ceilings? It's a huge expensive mistake when the damage is done, not to mention you and your family's safety.